Bangs Gang Front line Known As Chinedu Akanigwo a.k.a G Boss Came Up With His First Hits Titled ” Iranu “ And This hits Is A Street Vibes Called Shaku Skuku Vibes, Which Came Out To Be Nice And Is Showcase everywhere and it is being said that the street vibes would be stronger than legbegbe itself. 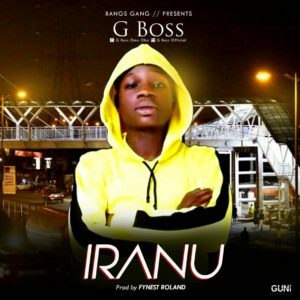 Iranu is the hits and G Boss is the name. Bangs Gang is the Crew. Produced By Fynest Roland. Proudly Promoted By Okcityloaded Entertainment Promotion.